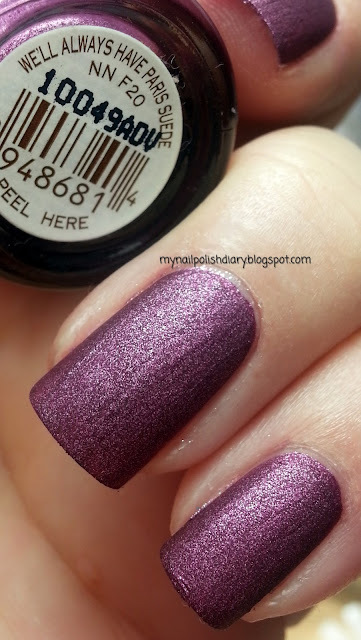 OPI We'll Always Have Paris Suede was released in the fall of 2009 in the Suede collection. I love me some suede polish. It's matte with bling :) This polish is a bit thick but not in a bad way. You need to polish fairly quickly because it dries really fast. You could even get by with one coat if you do a good job. I always do a second coat though because I don't get smooth enough lines on the edge and at my cuticle. I'd rather do two coats than spend an eternity doing clean up. I love this entire collection. It's my favorite suede! I adore it. Thanks for looking!